Have you given up on burgers because you’re trying to cut bread out of your diet and wrapping it in lettuce just isn’t doing it for you? Well, once again, I have you covered with this amazing tasting, easy to make, low carb, keto and weight loss friendly burger. Hey, don’t forget to share this with other likeminded, health conscious folks that are looking for yummy, healthy, easy to make recipes as well! 1. Combine all ingredients except spinach and mushrooms and form into patties. 2. Remove gills from mushrooms with spoon. 3. Grill burgers and mushrooms until desired wellness. 4. 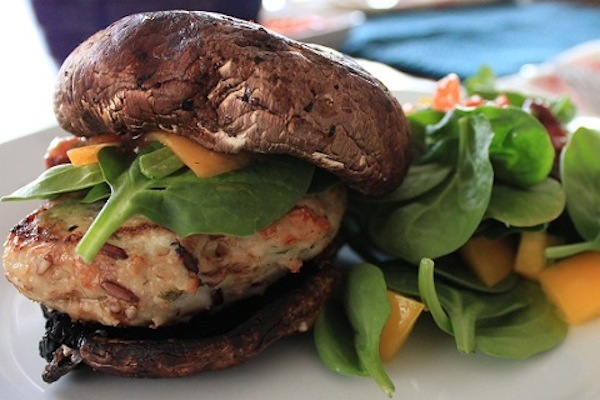 Serve burgers on mushrooms, topped with spinach.